The Indianapolis Colts used a Week 17 win to jump out of the AFC South cellar, beating the Houston Texans 22-13 Sunday to jump over the Texans in the standings by a tiebreaker, with both teams finishing the season 4-12. The Colts trailed 13-7 at halftime, but had a Marlon Mack touchdown, two field goals, and a safety in the second half while holding Houston scoreless to end the season on a moderate high not. In a game that seemed like both teams were just trying to run out their seasons, Yates played incredibly conservatively. He threw just four passes beyond 20 yards downfield and completed just one, though that completion was easily his most impressive throw of the day. Yates really struggled under pressure, completing just 2-of-7 passes for 16 yards and an interception on such plays. Thompson made the most of his limited snaps, turning all three targets he saw into catches. All three receptions were for first downs, two of which he had to make plays after the catch to pick them up. He averaged 2.45 yards per route run for the game. On one hand, Cunningham was able to be effective, allowing four catches for 22 yards on five targets with just one play going over five yards and also recording five stops and seven tackles. However, on the other, he missed two tackles and was able to be blocked out of the play. 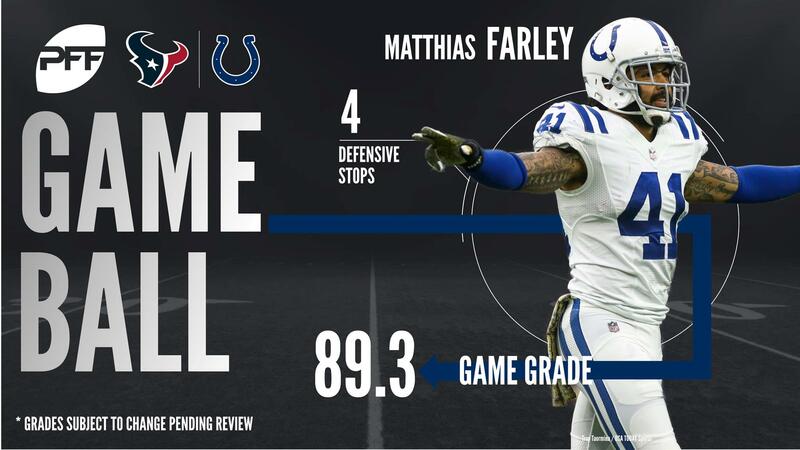 Both starting cornerbacks for the Texans were able to shut down the Colts passing attacks as Jackson and Johnathan Joseph allowed three catches for 13 yards on eight targets combined. Jackson separated himself from Joseph by breaking up two passes and only allowing one reception for eight yards on three targets. Farley had a big day as a run defender, finishing the day with a 94.8 run-defense grade that led both teams. He made four solo run stops in the game and had multiple other impact plays. He also added a quarterback hit on one of his two pass rushes. Wilson came up big in this game for the Colts defense and finished with a coverage grade of 83.4. Wilson was targeted five times in coverage and allowed just two receptions for a mere 15 yards. He was draped all over his man all game, and was rewarded with a late interception on the last play of the game.